Did you know Sept. 11 marks the 240th anniversary of the Battle of the Brandywine, the largest single day battle of the Revolutionary War? The Chester County Commissioners are honored to commemorate this anniversary, share news on opportunities to engage with our history, and celebrate a grant awarded for further studies of the battle. There will be two days of re-enactments in Birmingham Township, Chester County on Sept. 16 and 17 to recreate a part of the historic confrontation between American and Crown Force soldiers at historic Sandy Hollow. This re-enactment is taking place on the very lands where some of the fiercest battle action occurred. 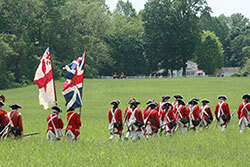 Click here to read more about the Brandywine Battlefield.